For the longest time, Carnival of Souls was little more than a title, a couple of stills in film books and the suggestion of something special. Those who'd actually seen it were few and far between and tended to be people who wrote magazine articles rather than those you met over a coffee. Early in this new millenium the film was released on US DVD in its restored director's cut, and when I showed it to a group of reasonably genre savvy friends I was surprised to find that none of them had even heard of it. Certainly few would have come to the film through the work of its director, the backwards-sounding Herk Harvey, whose only dramatic feature this was in a career that was otherwise spent making industrial films. And yet its influence can be felt in a wide range of subsequent genre works, including one very famous, not-so-long-ago feature that launched a particular filmmaker's career. 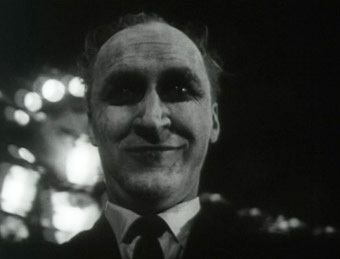 If it seems that I'm being evasive it's because I am, as the key element that has been borrowed from Carnival of Souls is it's plot structure and final reveal, and to name the films it influenced would be to give the twist away. Mind you, there's a good chance you'll guess what it is just a few minutes in to Harvey's film, but that really is all down to the number of times it's been recycled since. With little cinematic precedent, it's unlikely a 1962 audience would have had a clue what was really going on until the final scenes. That we can now guess the ending before the film is ready reveal it is a bit of a shame, but strangely does it no real harm, as an awareness of what's happening doesn't change the fact that Carnival of Souls is still one of the most atmospherically eerie works of American horror cinema. It's difficult to know just how much of the plot to summarise here, as even a cursory summary will serve as a giveaway for the horror familiar, so if you want to go in cold I'd skip to the final paragraph. As for the rest of you...well proceed with caution. It starts with our leading lady Mary (Candace Hilligoss) in a car with two of her friends being challenged by some local guys to a road race. As they cross a river bridge, the guys playfully nudge the girls' car, which smashes through a wooden barrier and plunges into the river below. The police arrive, a search is organised and all looks lost, but then Mary emerges from the water, traumatised, covered in mud but still in one piece. She returns to her normal life and takes up the job she has been training to do, as a church organist in Salt Lake City, but finds herself repeatedly troubled by visions of a nearby abandoned carnival and a smiling, white-faced man with dark rimmed eyes. Carnival of Souls was made on a budget of aproximately $30,000 and displays in its opening scenes that unrehearsed black-and-white immediacy that George Romero was also to employ six years later in Night of the Living Dead (the similarities between the two films extend to character and imagery). The road race and car crash are unspectacularly staged and with absolutely no build-up – it's almost as if we've wandered into the story mid-way, the first line delivered in that engaging 60s indie manner that suggests the actor has been plucked from the crowd and asked to improvise on the spot. The credit sequence that follows is surprisingly classy and in the blink of an edit we go from Mary's emergence from the water to her meditative return to the scene of the accident and her preparations to leave for her new job. There's something genuinely otherworldly about the atmosphere from the start, due in part to that low budget monochrome look that immediately separates the film from its Hollywood mainstream counterparts (not that there were any at the time) and an unsettling organ score that seems to almost float in the background. It makes an almost invisible diegetic switch for Mary's last practice session before leaving town for her new position, her musical skills bewitching enough for the organ factory workers to lift their heads and smile or stop what they're doing to watch and listen. It's a surprisingly captivating sequence, but one whose relevance to the later story and its conclusion, as well as Mary herself, is complex enough to warrant the sort of discussion that should only take place between those who've already seen the film. And so again I am forced to be evasive, but herein lies the problem for any detailed analysis of a film whose every turn ties in to the final reveal. It's on the night-time drive to Salt Lake, as Mary approaches the road to the abandoned carnival, that she has her first visions of the white-faced man (played by director Harvey), creepily reflected in the side window of her car, then as a figure in the road ahead. The apparitions continue when she reaches her destination, when the face appears at the window of her boarding house (in one of my favourite expressionist moments, Mary pulls back the net curtain to reveal her own reflection fragmented by the double-glazed window). A menace of a different sort soon appears in the shape of lascivious neighbour John, whose sleazy advances Mary responds to with an almost child-like unawareness of his true intentions. 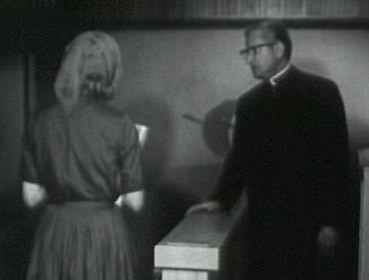 Her job starts well, her playing prompting the old school church minister to remark dreamily (and tellingly) to his cleaning lady, "We have an organist capable of stirring the soul." He later changes his tune when, in one of the film's most unnervingly realised scenes, Mary is pulled into in a trance of skewed organ music and disturbing visions of the carnival populated by ghostly dancing figures. It's a image revisited towards the film's end, where the shudder factor is increased in a way that it would be unfair to reveal here. There I go again. It's the design and execution of these scenes that have helped earn Carnival of Souls a cult following and its place in the horror hall of fame. Genre rules are effectively cast aside, with horror's love affair with the close-up discarded in favour wide shots in which the the action is accelerated rather than slowed down, a rare example of speeded-up motion prompting goose pimples rather than sniggers. The disturbing image of ghoulish faces rising from darkened water is also a real skin-crawler and prefigures not just the zombies of Romero et al, but an iconic image from Apocalypse Now. It's perhaps a little ironic that the film's low budget ends up contributing to its creepy effectiveness rather than working against it. Aside from the uneasy artificiality that the non-professional delivery of dialogue sometimes creates, Harvey had no money for special effects or complex make-up, and was thus forced to find more practical alternatives. The best ideas are often the simplest, something evidenced in Mary's two bouts of reality dislocation, which are achieved simply by muting the soundtrack and having everyone ignore her presence – I seriously doubt any high budget, CGI-assisted interpretation of the idea would be half as effective. Harvey also makes great use of his deserted carnival location, which really does feel like it has been abandoned by the world and transformed into a holiday haunt for the undead. That Carnival of Souls is driven more by atmosphere than plot proves no problem when that atmosphere gets so thoroughly under your skin. It also ensures that subsequent viewings are rewarded and second guesses regarding the narrative twists do little to harm the viewing experience. 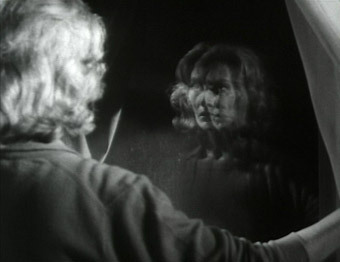 It's one of the few films that genuinely deserves to be labelled dream-like – comparisons have been made the work of Cocteau and Bergman, and Bruce Kawin described the film as having the feel of "an episode of The Twilight Zone directed by Ed Wood and Antonioni" – while its effects-free drift into nightmare is more hauntingly realised than in any of the small lorry-load of films it subsequently influenced. Oh nuts. OK, Carnival of Souls was a low budget feature and for years was effectively unavailable, until the copyright expired and it was released into the public domain. Thus you're tempted to make excuses when picture and sound aren't up to scratch and they're certainly not here. The 1.33:1 transfer on this disc has undergone NTSC to PAL conversion, and although there are no major motion issues, image sharpness has clearly suffered in the process. The contrast is on the harsh side, resulting in generally weak shadow detail, and there is a surprising amount of dust and damage on display, plus the odd splice mark at the top or bottom of frame. The mono soundtrack is worse, with much of the dialogue fluffy or muffled, a bit like you'd expect it to sound if you were storing your dirty laundry in your speakers – I honestly couldn't make out what the driver says to the girls in the opening shot. There is also some minor distortion on some of the dialogue and music, all of which varies from scene to scene. That the spoken dialogue doesn't always match the mouth movements is old news for this film, the result of some no-so-hot ADR work on the part of the filmmakers themselves. As I mentioned above, there's the temptation to hope for better but shrug and accept that this is the best the film is likely to look after its checkered distribution and ownership history. Unfortunately for UK distributor Network, the film was released in the US back in May 2000 as part of the Criterion Collection, and comparing the two discs is an eye and ear-opening experience. the bottom from the Criterion release. The transfer on the Criterion disc is excellent, boasting far superior sharpness and contrast and little trace of the dirt and damage still visible here. The soundtrack is also considerably better, with the dialogue clear and the music free of any serious distortion. In the quality of its picture and sound alone, the Criterion disc leaves the Network one standing. More problems here for Network, given that the Criterion release was a 2-disc Special Edition and included both the original release cut of the film and the slightly longer director's cut (the Network disc has the director's cut, which is a logical choice, although it appears to be missing the opening shot from the Criterion version), plus a documentary on the 1989 cast and crew reunion, 45 minutes of outtakes, an illustrated history of the Saltair Resort in Salt Lake City (the location for the carnival scenes), a video update of the film's locations, a trailer, selected audio commentary by screenwriter John Clifford and director Herk Harvey, an essay on and an hour of film excerpts from the Centron Corporation, for whom Harvey worked for over 30 years, and printed interviews with Harvey, Clifford and leading lady Candace Hilligoss. Phew. The Network disc only has two extras, but fortunately the main one is a goodie. The Commentary by Kim Newman and Stephen Jones is a consistently lively and informative affair, with the two genre writers bouncing well off each other, passing comments on specific scenes, providing background information on the production and throwing in all manner of trivia and theory regarding influences on the film and its own influence on later genre works. Essentially a debate between two enthusiastic but knowledgeable film fans (and they really do know their movies, though Jones admits to being less of a torch-bearer for this one than Newman), but a consistently enjoyable and interesting one to sit in on. Also included is the Trailer (2:18) which sports an amusingly deadpan voice-over (spiced up with some spooky reverb), clearer opening dialogue than in the film itself, and a warning that no refunds will be offered if you run screaming from the cinema. William Castle would have been proud. A low budget genre gem let down by a standards-converted transfer from a weak original. The commentary track by Newman and Jones is good stuff, and with the two also contributing a commentary to Network's simultaneous release of The Ghoul, we can only hope this is the first of several such collaborations. But with the Criterion 2-disc set still available and scoring over the Network one on almost every count, it's damned hard to wave the flag for this one.